We make it the way you want it. Cre8 a Couch offers 100% custom couches, so why settle for less? We allow you to modify designs and dimensions the way you want it. There is no compromising with Cre8 a Couch! 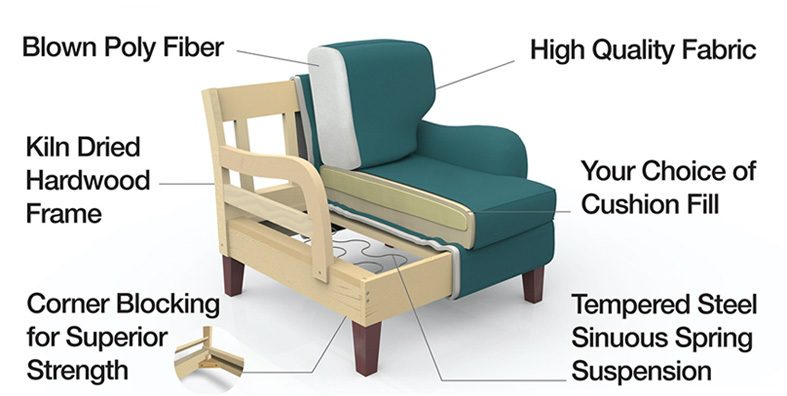 All our furniture pieces are manufactured in the USA. Each piece is built by our local manufacturing partners. Each piece is carefully hand crafted and assembled by highly skilled artisans. We offer affordable and highly competitive prices. We keep costs down by specializing and maintaining intimate showrooms. We strive to save our customers money. Cre8 A Couch specializes in high quality construction. All frames are made with 100% kiln dried solid wood. A variety of spring suspension systems are available. Have one of our certified team members walk you through the design process at your convenience in the comfort of your own home. With the options in hand at your home, our team members will simplify the decision making process for you. We will measure and bring everything to you! of interior designers and will gladly refer their professional services based on your needs.